I know most of u know & make the hotel sambar at home.Even I too posted an idli sambar with toor dal long time back which learnt from my MIL.It tastes similar to the hotel ones. But I should say this is the exact recipe for restaurant style sambar. I got this recipe from Aval vikatan’s supplementary.Yesterday I tried this for my guests. My guests liked it so much,I was showered with compliments and they were asking for the recipe. Thanks to Mrs. Revathy shanmugam for this yummy hotel kind of recipe. 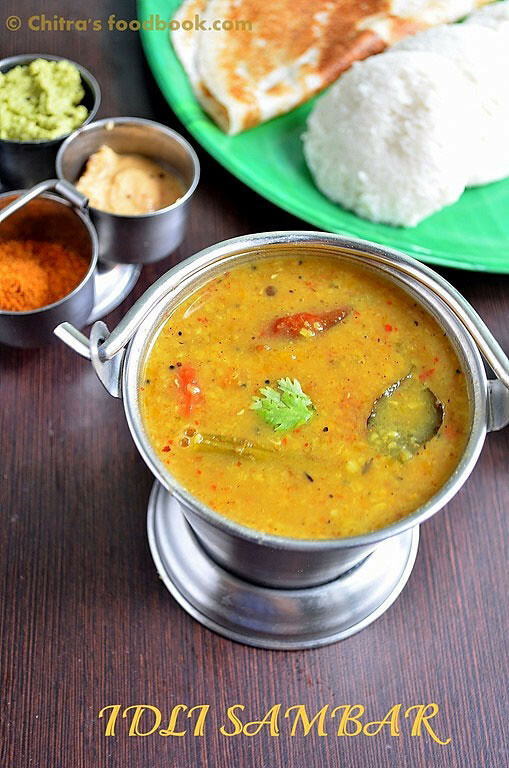 It tastes mildly tangy with more of dal,less spicy and u can even drink this sambar . You can use this as basic Tiffin sambar recipe for making sambar vada,Mini idli sambar etc.It’s a great side dish for Idli,dosa recipes.My friend Jayarani gave me a tip recently. She told me to add pumpkin instead of jaggery and she also suggested me to use drumstick. Yes, as she told adding pumpkin gave a mild sweetness and drumstick gave a nice flavour.I have updated the recipe adding them. Do try this ,I am sure u’ll get the exact taste as in most of the restaurants.It goes well with idli , dosa , Venpongal and vada.Check out this recipe for another version of hotel sambar if interested. Check out my MINI IDLI SAMBAR RECIPE too. Vegetables ( Carrot & potato) – If needed. In a kadai roast all the above said ingredients and make it a powder. In the same kadai , add oil and temper all the items in the same order.Now add the sambar onions and saute till transparent. Then add the tomatoes ( crush it with ur hands before adding , this makes the sauting process faster ) and required salt. Saute till tomatoes turn mushy and juicy. Add the tamarind extract , raw pinched curry leaves , hing, sambar powder and turmeric powder. Allow to boil till the onions get cooked.Now add the mashed dal,cooked vegetables ( if using) and the ground powder. Mix well so that there are no lumps. Boil for few minutes. It will thicken. Add more water if necessary . Switch off the flame add garnish with coriander leaves. Last but not the least , don’t forget to add a tbsp of ghee & Cover it with a lid until u serve.. Enjoy with idli,dosa and pongal! 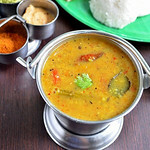 U can use the combination of moong dal and toor dal in equal quantities and make this sambar.. Adding pumpkin gives a sweetness to the sambar . So no need to add jaggery or sugar. If u don’t add pumpkin use either jaggery or sugar while sambar boils..
Make this sambar atleast 3-4 hours before serving because all the tastes blends well .U can reheat it while serving. For variations , u can add a tbsp of grated coconut while roasting the powder ingredients and powder them..
Tastes great the next day with full aroma !! ENJOY THIS SAMBAR WITH SOFT IDLIES.CRISPY DOSA & VEN PONGAL !! 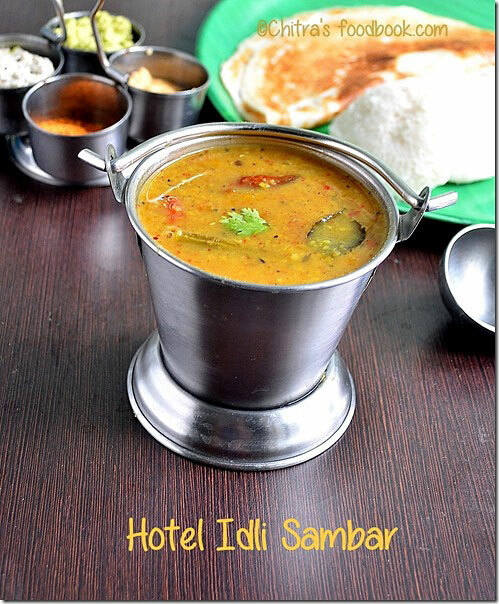 I have always made sambar with only toor dal...will try this one..looks just like the hotel sambar. Aromatic and tasty sambar,thanks for sharing. I can have two more idlies with this sambar, my fav..
That looks so delicious... i would love mini idlis dunked in this. sambar looks delicious... will try this version soon..
seriously looks so so delicious! Perfect. Looks exactly like the holet sambar. Wow delicious..can just imagine the taste..yummy. Perfect combination ... Delicious !!! i tried this sambar last week and it came out really well. Tasted exactly like hotel sambar. My hubby liked it very much. We had it with pongal, dosa and vada. Tasted even better the second day. thanks for the post. I would appreciate if u add a seperate section for "Festival Sweets" (hindu festivals and the sweets - naivedyam we make for it). It will help the people living in abroad like me a lot. Chitra love u ragi idli came out very soft n prepared hotel style sambar which u had posted,my hubby n kids were very happy tnx a lot. We prepared this sambar today and it was absolutely delicious. We totally loved it. It tasted great with dosa. We felt that the taste was excellent than the restaurant ones. We will make this often for sure. Thank you so much sharing this recipe and for your help in my queries to try this recipe. Glad to see your positive feedback :) Thank you so much !